I live in Minnesota but spend January in San Diego. I enjoy flying with the Silent Electric Flyers of San Diego (SEFSD) at the Mission Bay field (not to mention the fabulous banquet in January), but I needed a reasonably sized model airplane that would travel well on an airline. 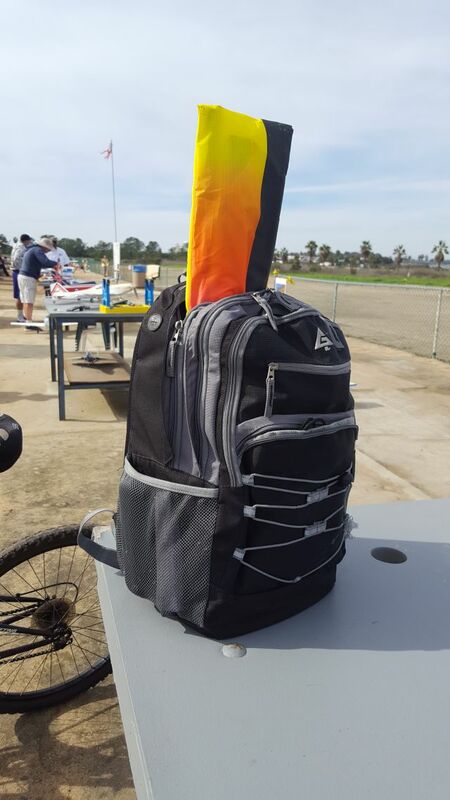 Last year, I modified a Prism Zero G Glider Kite (purchased at the kite store in Seaport Village) for this mission (see the March 2018 SEFSD Peak Charge for details). This year I decided to design a more robust Kite-Plane from a Prism Isotope kite purchased from the kite store in Seaport Village ($55). It flies quite well as a kite. As an airplane, it flies even better. High overhead, it looks like a kite without a string, traveling cross country. A light weight rudder (foam board) provides yaw/roll control (using dihedral). 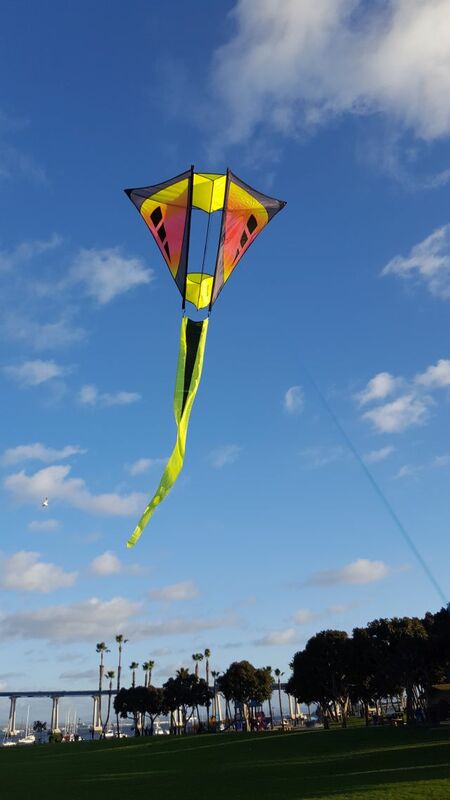 The dihedral is accomplished by pulling a tight string across the back of the kite from the right corner to the left corner – like you have all done with the typical diamond kite. 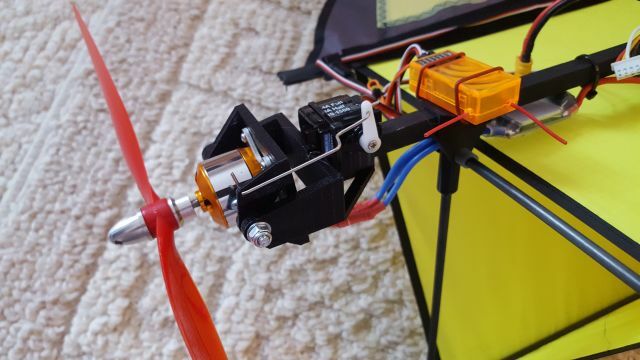 The motor is gimbaled up and down to provide pitch control. This gives very effective pitch control as long as you have some power applied to the motor. When you cut the throttle it becomes a glider with only yaw/roll provided by the rudder. To land, you need to add some power and a lot of up “elevator” to enter a high alpha mode. If you play it just right, you can “plop” it down right at your feet. The conversion was very successful. It can be flown either as a kite or airplane. All of the special fittings for this Kite-Plane were created in 3D CAD and printed on my low cost 3D printer. All the parts could be built up with wood, but the 3D printing process allows a lot of tweaking/redesign in a short period of time. I think the basic kite frame is fiberglass. I used some 3/16 wood dowels and carbon fiber rods along with the 3D printed fittings to complete the structure. The empty weight is 576 grams and the All Up Weight with a 3S 1500mah Lipo is 715 grams. The wing span is 48 inches. The motor is a Cheetah 2212-13 1000 KV with a 10 x 4.5 prop. It flies nicely with just under 50% throttle. Measured flight time is 21 minutes when the 3.6V warning beeper starts telling me it’s time to land. It handles wind very well up to point. 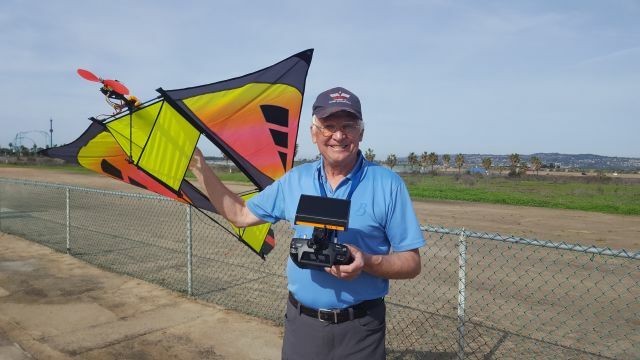 At the SEFED field, I was able to fly it slow enough to fly “backwards” with an 8 mph breeze. Since we stay in Coronado for the month of January, the Kite-Plane makes a great backpack airplane. I ride the Coronado Ferry to the Broadway Pier, then take the trolley to the Morena/Linda Vista stop. The bike takes me the rest of the way to the SEFSD field. 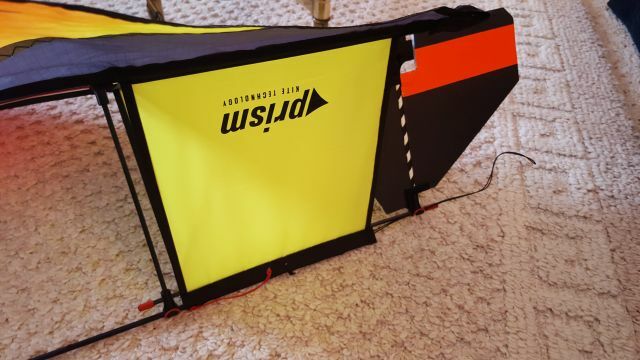 Attached are some photos of the Prism Isotope Kite-Plane in the kite configuration, airplane configuration, and backpack configuration. Click HERE for a nice video of the Isotope. Back when my Partner and I lived in Costa Mesa, then blocks away from a slope soaring hill north of Estancia High School, away from the unrelenting traffic of urban SoCal, with a view of the ocean (since ruined for slope soaring by trees below) and (then) home of the biggest soaring society in the USA (what is now left of the Harbor Soaring Society). When she reported she was interested in slope soaring I went over to Hobby People year 1992 in Fountain Valley and bought my first RC airplane kit, a Wanderer. It had been half a lifetime then since I last assembled control line and free flight airplanes, the pain stacking assembly out of wood sticks, glues and heat shrink covering took about (40) hours to produce a ruder and elevator basic thermal glider. Repairs were every flying session. That having learned to fly with a fragile, six foot wingspan glider, among world champions, has me one of the best at landing in the wind even in the here and now. Well, the Wanderer (two of them eventually) as did RC flying in general, lasted longer than that partnership and I finally learned to fly by remote control. Ten years ago, relegated to the couch back in Germany’s Rhein-Main by the depression, at the request of the Silent Electric Fliers of San Diego newsletter editor (then and now, we’ve known each other since I started RC flying and he still has the same camper van, although no longer a mobile hobby shop) rather than just translating from German RC magazines, I began organizing my construction notes and flight logs into magazine articles. Of which many have been published in the Silent Electric Flyers of San Diego (SEFSD) newsletter. All together I assembled (55) flying wings and over a dozen Multiplex Easy Star I and II (the two is covered by a SEFSD article) before the pusher propeller “whine” got to me and I moved on. My most recent article was about a Multiplex Twin Star II published fall of year 2016. That airplane is for sale. My Twin Stars fly great, far better than most you see. But, they are too big to be carried assembled in my camper, I wanted something smaller and in a different direction. I am making progress . All controls are in place and work well. Using a cassette tape for the itty bitty mylar hinges worked out great. Very limber, strong and light. Next post Scale MQ-9 UAV R/C Project – Cheap and Easy Vac-U-Forming!